Like to experiment with layering different scents? 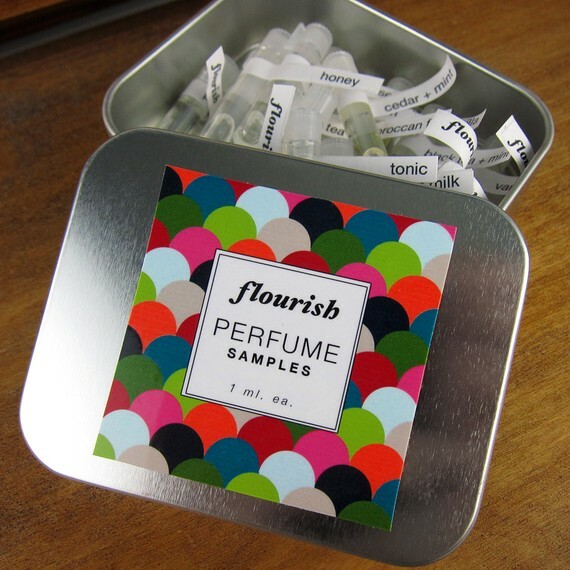 Here’s your chance with the Flourish Bath & Body Deluxe Perfume Sampler! For the past week, I’ve been having fun playing mix n’ match with my Flourish Bath & Body Deluxe Perfume Sampler. In the sampler, you get 18 1ml vials of their scent catalog for a mere $25. That’s a steal! Most perfume samples are $2 – $5 each! First impression, Flourish perfume oils are high quality and well-blended. They smell crystal clear with no plasticky dry down like some indie perfume oils. My favorites so far are Pomegranate Rose, Woodsmoke & Vanilla, Vanilla & Amber, Almond Milk, and Saltwater. (Stay tuned for my reviews!) They are basic scents but far from boring. They are beautiful worn alone and perfect for layering to create an entirely new fragrance. The list goes on forever. I can easily lose myself playing pretend parfumeur. This set inspires me to blend my own perfumes! Flourish is quickly becoming a favorite of mine. I love their bold and sophisticated packaging. The Deluxe Perfume Sampler would make a great gift for any perfume oil hoarder lover. Check Flourish out on etsy! Sidenote: After December 2011 Flourish will be changing their brand name. They will unveil their new name January 2012. Try Pomegranate & Rose with Vanilla & Amber. Not a scent you’d think of mixing but I tried it today & quite liked the result.